Download "Course 6425C: Configuring and Troubleshooting Windows Server 2008 Active Directory Domain Services"
1 Course 6425C: Configuring and Troubleshooting Windows Server 2008 Active Directory Domain Services Length: 5 Days Published: June 02, 2011 Language(s): English Audience(s): IT Professionals Level: 200 Technology: Windows Server 2008 Type: Course Delivery Method: Instructor led (classroom) Overview About this Course This five day instructor led course provides in depth training on implementing, configuring, managing and troubleshooting Active Directory Domain Services (AD DS) in Windows Server 2008 and Windows Server 2008 R2 environments. It covers core AD DS concepts and functionality as well as implementing Group Policies, performing backup and restore and monitoring and troubleshooting Active Directory related issues. After completing this course students will be able to configure AD DS in their Windows Server 2008 and Windows server 2008 R2 environments. The course also provides a direct mapping to the objective domain of the : TS: Windows Server 2008 Active Directory, Configuring exam. 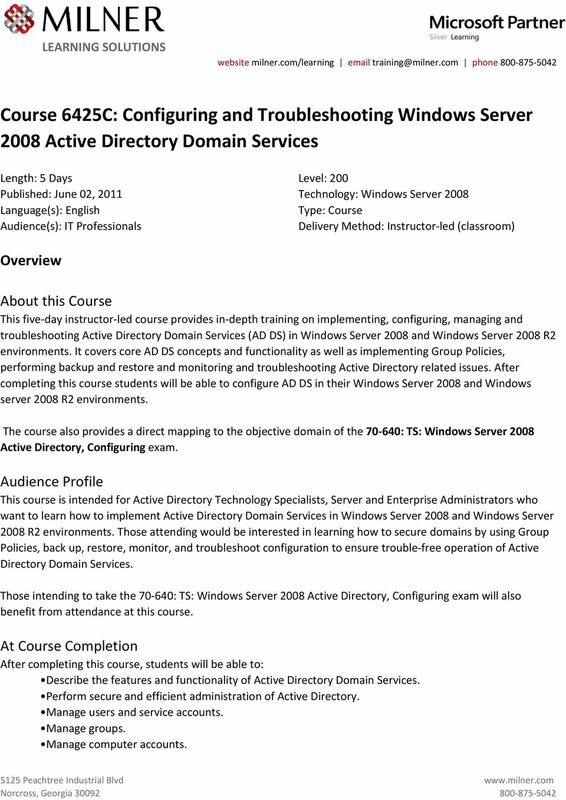 Audience Profile This course is intended for Active Directory Technology Specialists, Server and Enterprise Administrators who want to learn how to implement Active Directory Domain Services in Windows Server 2008 and Windows Server 2008 R2 environments. Those attending would be interested in learning how to secure domains by using Group Policies, back up, restore, monitor, and troubleshoot configuration to ensure trouble free operation of Active Directory Domain Services. Those intending to take the : TS: Windows Server 2008 Active Directory, Configuring exam will also benefit from attendance at this course. 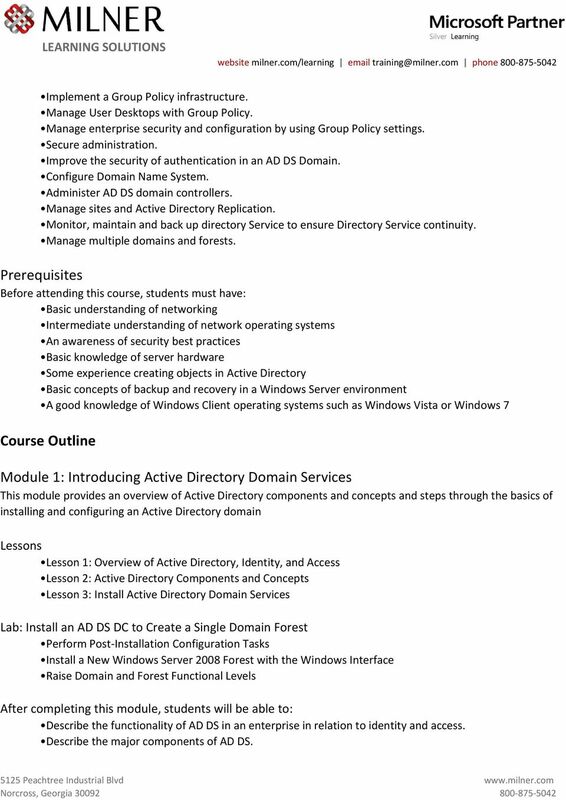 At Course Completion After completing this course, students will be able to: Describe the features and functionality of Active Directory Domain Services. 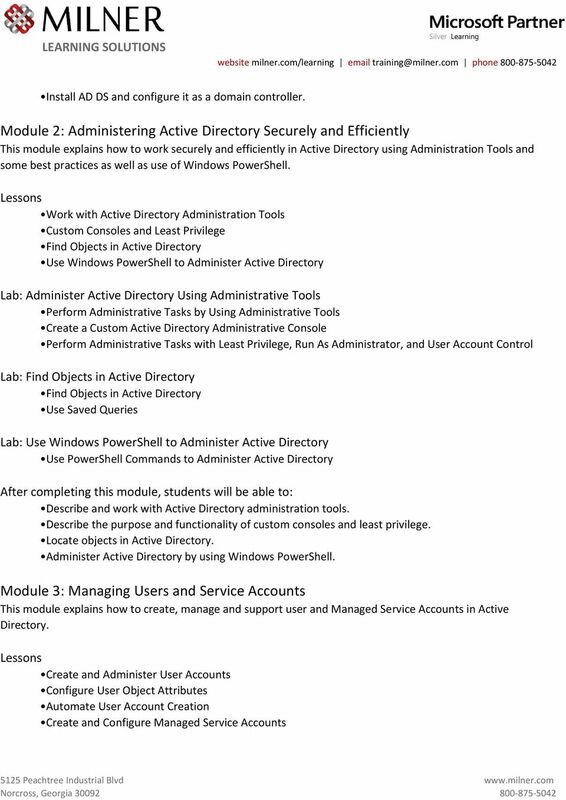 Perform secure and efficient administration of Active Directory. Manage users and service accounts. 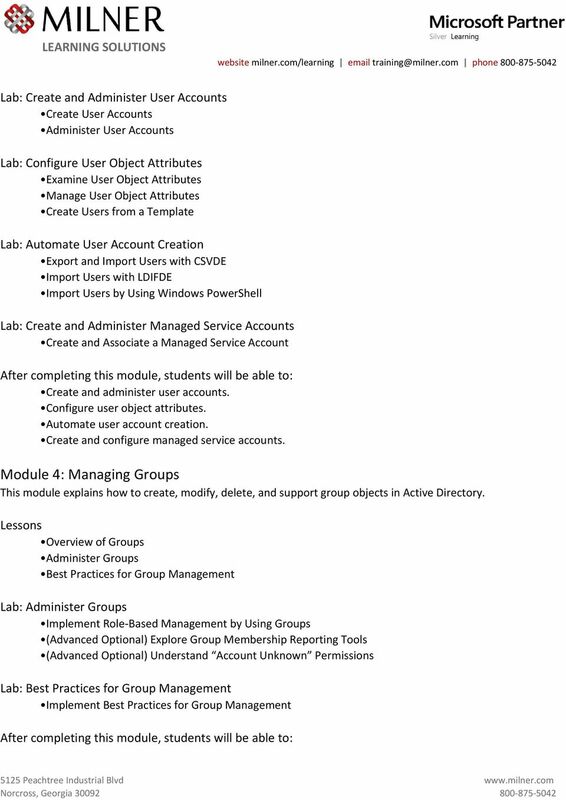 Manage groups. Manage computer accounts. 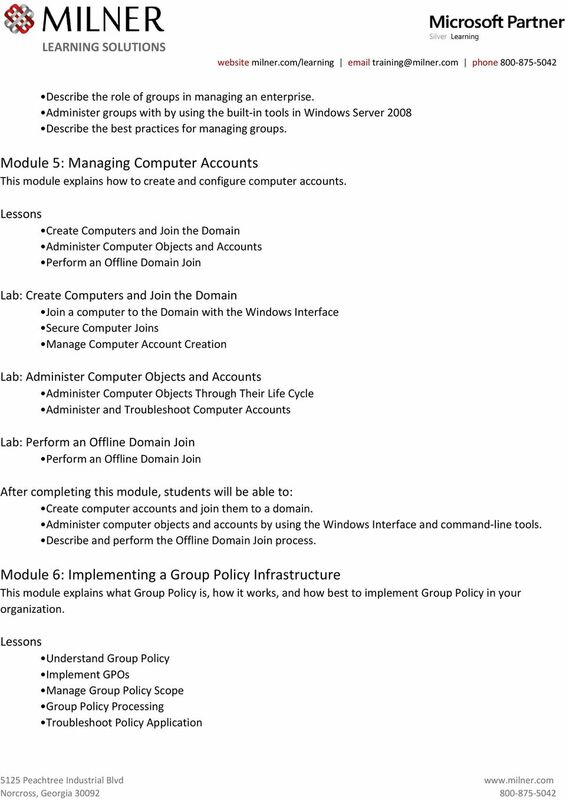 2 Implement a Group Policy infrastructure. Manage User Desktops with Group Policy. 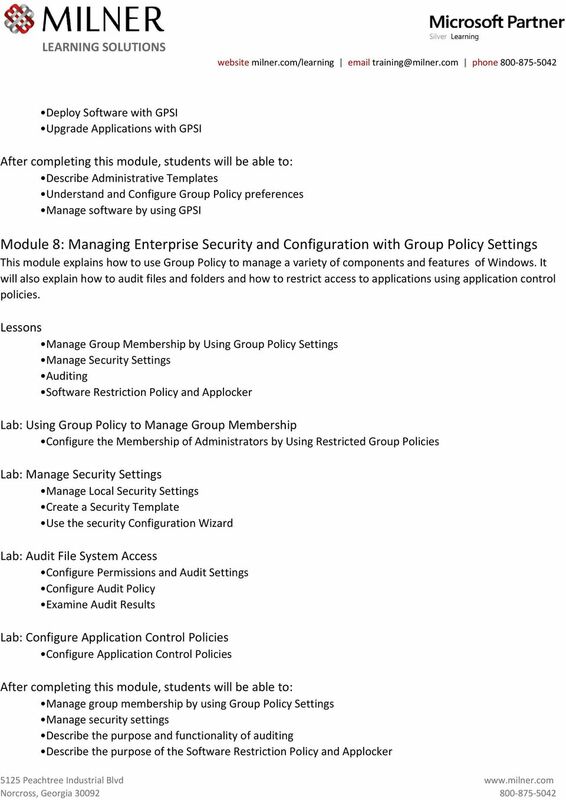 Manage enterprise security and configuration by using Group Policy settings. Secure administration. Improve the security of authentication in an AD DS Domain. Configure Domain Name System. 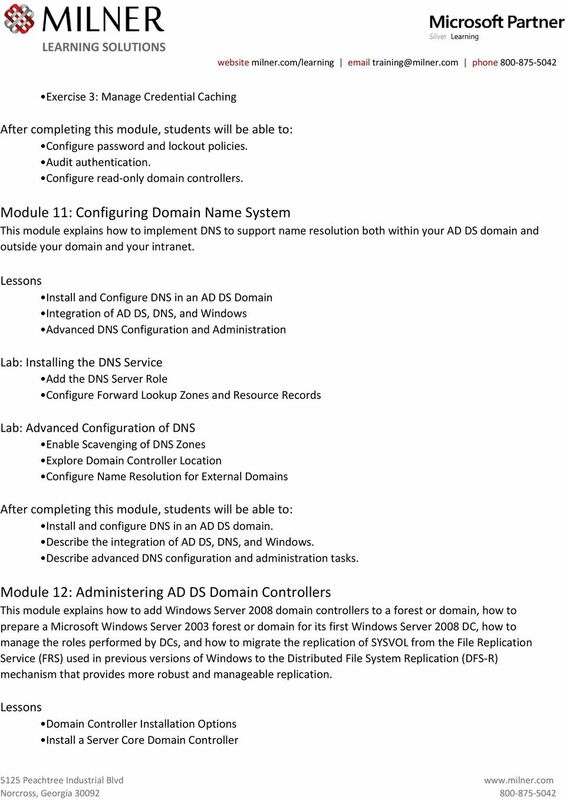 Administer AD DS domain controllers. 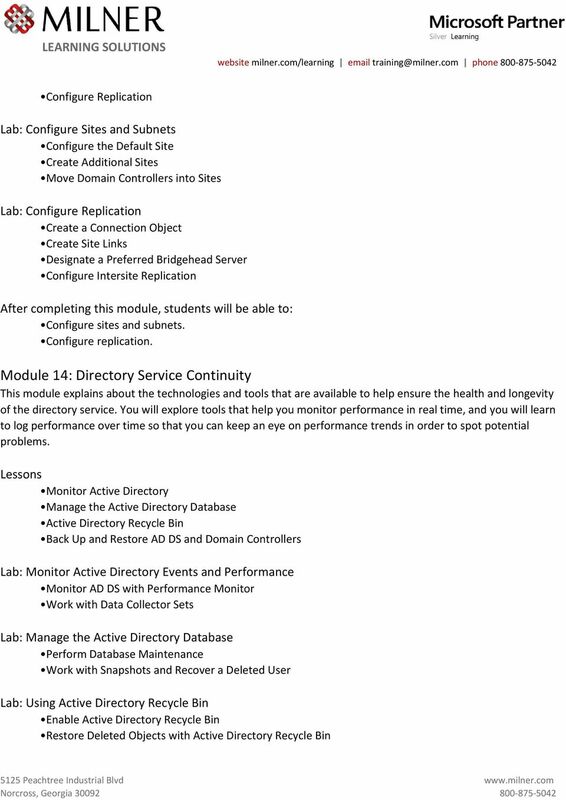 Manage sites and Active Directory Replication. Monitor, maintain and back up directory Service to ensure Directory Service continuity. Manage multiple domains and forests. Prerequisites Before attending this course, students must have: Basic understanding of networking Intermediate understanding of network operating systems An awareness of security best practices Basic knowledge of server hardware Some experience creating objects in Active Directory Basic concepts of backup and recovery in a Windows Server environment A good knowledge of Windows Client operating systems such as Windows Vista or Windows 7 Course Outline Module 1: Introducing Active Directory Domain Services This module provides an overview of Active Directory components and concepts and steps through the basics of installing and configuring an Active Directory domain Lesson 1: Overview of Active Directory, Identity, and Access Lesson 2: Active Directory Components and Concepts Lesson 3: Install Active Directory Domain Services Lab: Install an AD DS DC to Create a Single Domain Forest Perform Post Installation Configuration Tasks Install a New Windows Server 2008 Forest with the Windows Interface Raise Domain and Forest Functional Levels Describe the functionality of AD DS in an enterprise in relation to identity and access. Describe the major components of AD DS. 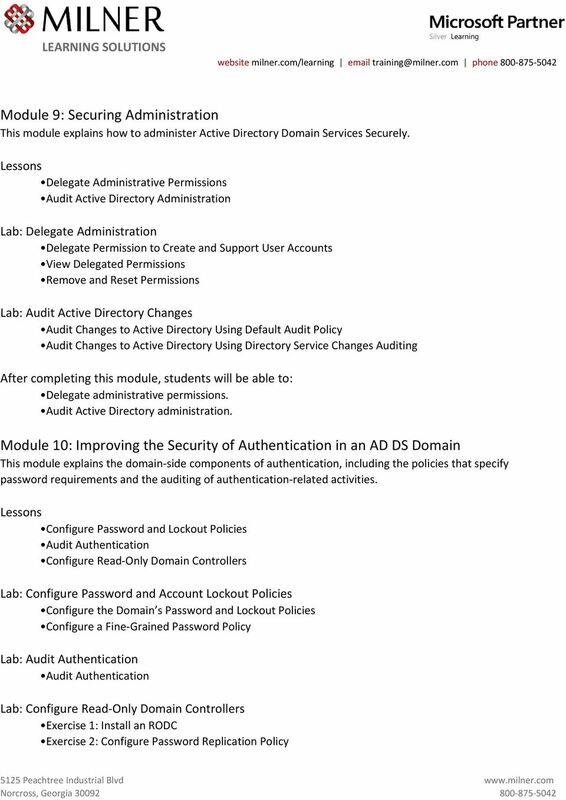 12 Lab: Back Up and Restore Active Directory Back Up Active Directory Restore Active Directory and a Deleted OU Monitor Active Directory. Manage the Active Directory database. Describe the purpose of the Active Directory Recycle Bin. Back up and restore AD DS and domain controllers. Module 15: Managing Multiple Domains and Forests This module explains how to raise the domain and forest functionality levels within your environment, how to design the optimal AD DS infrastructure for your enterprise, how to migrate objects between domains and forests, and how to enable authentication and resources access across multiple domains and forests. 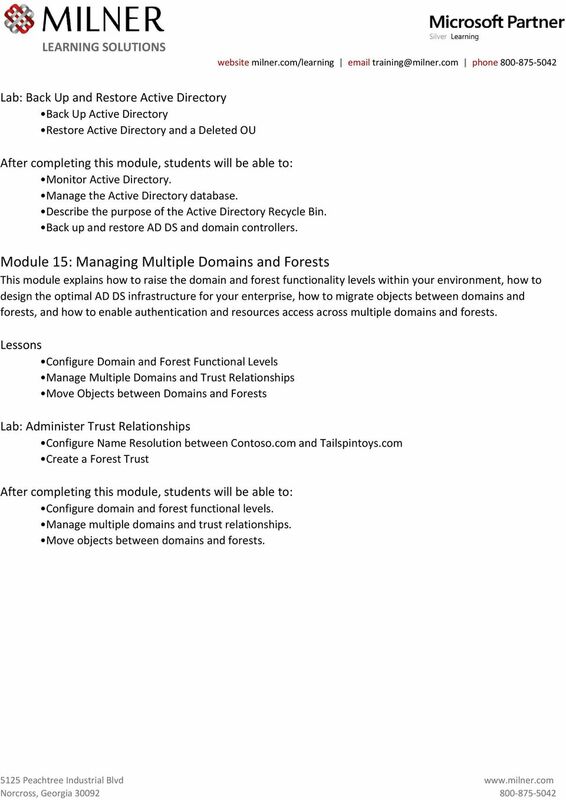 Configure Domain and Forest Functional Levels Manage Multiple Domains and Trust Relationships Move Objects between Domains and Forests Lab: Administer Trust Relationships Configure Name Resolution between Contoso.com and Tailspintoys.com Create a Forest Trust Configure domain and forest functional levels. Manage multiple domains and trust relationships. Move objects between domains and forests.